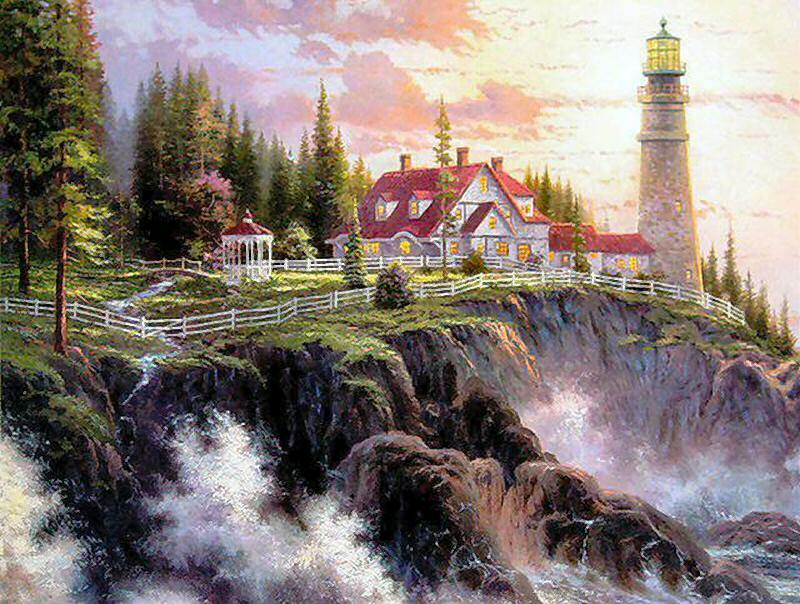 Clearing Storms is the fourth painting in Thomas Kinkade's popular "Seaside Memories" series. ++++ Tom created this painting in September 1997. 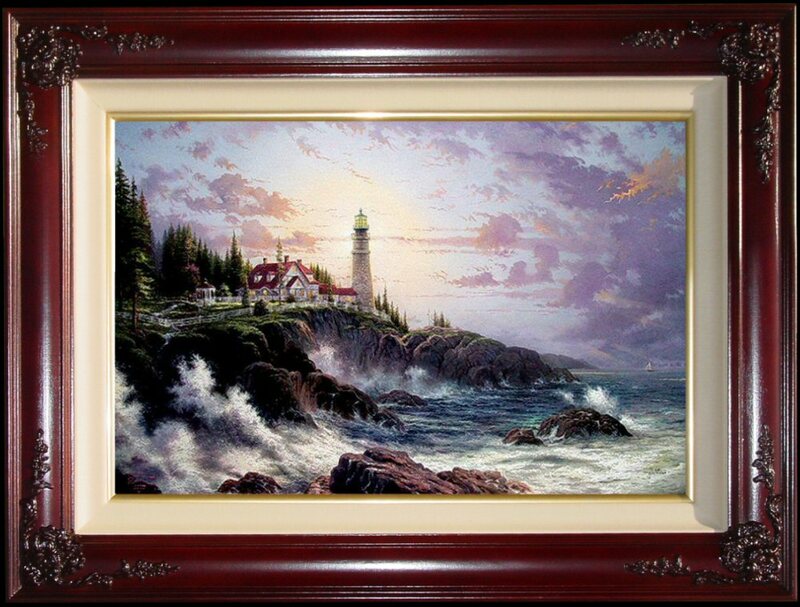 ++++ Brass Plaque with the legend "Clearing Storms ~~ Thomas Kinkade"
++++ Theme: Oceanic, Nautical, Breaking Waves, Storm at Sea, Boat on the horizon. "I believe that God speaks to His faithful in many voices -- some intended for the ear, some for the eye, all for the heart. As a painter, my role is to interpret and clarify allegorical scenes that are rich with meaning. Clearing Storms is such a symbolic scene, charged with a message of hope that can give us the fortitude to go on. Storms -- dark, brooding, terrifying -- are a part of all our lives. When we're in the grip of a storm, we may feel overwhelmed, powerless, abandoned by God. The meaning of Clearing Storms is that God's love is eternal, and, because of that, the dart times always pass. 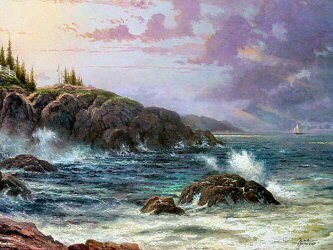 The power of the waning storm is still evident in the wild, turbulent sea. But up in the sky, God's light has touched the clouds with myriad colors, transforming them into harbingers of hope, and overwhelming man's feeble attempt to light the darkness with the lighthouse. A timid stream, which suggests to me an individual human life, makes its way to the great ocean. 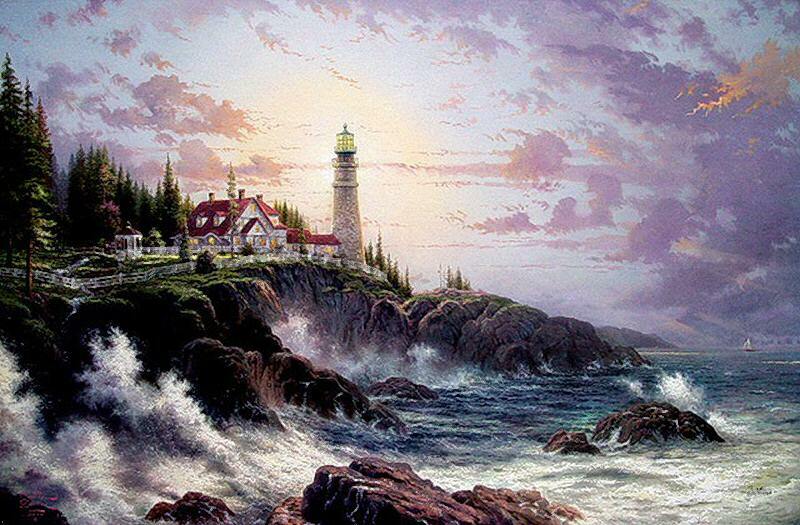 A gazebo provides refuge for the lighthouse keeper when storms have passed, where he can contemplate the wonder of it all in one of my favorite ways -- drinking in the warmth from a cup of hot tea." ~~~The Lighthouse depicted in "Clearing Storms" most closely resembles another North Carolina outer banks light ~~Ocracoke Light Station. ~~~The 1823 Ocracoke tower is currently the oldest operating lighthouse on NC coast. (Bald Head is five years older but no longer an active aid to navigation). ~~~The tower is 65 feet tall, and it is 75 feet to focal plane at the center of the lens.It has a fixed white light from a 4th order Fresnel lens. ~~~Keepers once boiled a concoction of glue and rice in huge vats and quickly applied the hot mixture as a protective coating to the brick."